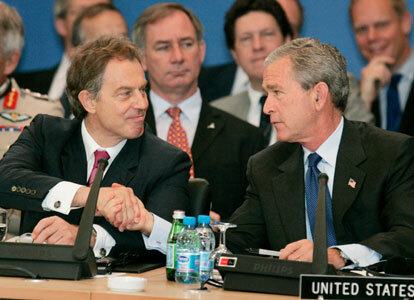 I love the look on Blair's face: "Yep, we're getting it done." Scenes like this renew my hopes for the future. We need Tony Blair. We need a lot more Tony Blairs (and GWBs) running the countries of this world. "One picture worth 1000 words about two leaders who've given their word to each other and the world"
"One picture worth 1000 words about two leaders who've kept their word to each other and the world"
Simple mutual good faith and goodwill, proven in action, are vastly more important than all the fancy theories of diplomacy in all the learned books in the world. This is what makes us strong, this is why we will win despite everything. It's there to be seen and admired - and emulated. I hesitate to join the hagiography of Blair. Yes, it's gratifying that he recognizes that terrorists are _hostis humani generis_ and has kept his country in the Coalition of the Willing. But he remains, by American standards, a very liberal politician. Perhaps he is more like Liebermann than Kerry, but I would be quite hesitant to support an American candidate who took the positions on social and economic policies that Blair does.